A delicious and easy to make lunch box dish or as a evening snack. 2. Saute the onions for a minute. 3. Add capcisums, carrot and saute for another minute or two. 4. Add paner and stir well. 5. After a minute add cumin powder, red chilli powder and salt. 7. Add coriander leaves, mango powder and stir again. 8. Warm the chapatis and place them on a flat surface. 9. Add 1 or 2 tblsp of the prepared filling mixture in the center. 11. Sprinkle spring onions and roll them tightly. 12. Serve at once or pack it for lunch. Tip: If desired, add mashed potatoes, tomatoes, green peas and sweet corn kernels. 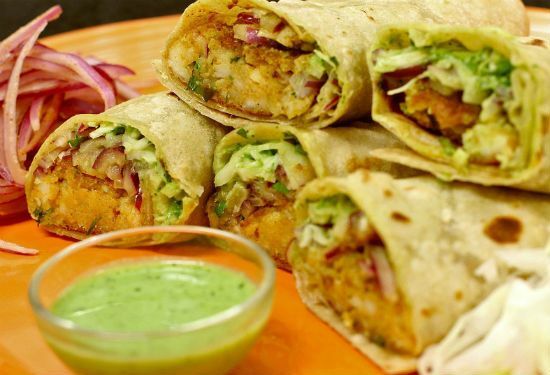 Feel free to comment or share your thoughts on this Paneer Veg Rolls Recipe from Awesome Cuisine.